Dewey Larson, after working with his Reciprocal System of physical theory for over 30 years, finally concluded that "the universe is nothing but abstract change, in three dimensions." After studying Larson's work for over 20 years, I have concluded the same thing. But WHAT is "abstract change? ", regardless of how many dimensions it works in? It is a question that has puzzled researchers for centuries and I believe the original concept comes from the Greek philosopher Anaxagoras, being passed down through history as the Alchemical prima materia--the primitive, formless base of everything, which Larson simply simply refers to in his books and papers as motion. In RS2, I tend to use the term, "ratio," a proportion (or "portions") of one magnitude to another. In the sense of motion, what we see is a "portion" of either space or time, reciprocally related to a full "portion" we call a clock. A speed of 10 mph is just a "10 mile" portion of space, compared to the "full portion" of one hour of time. If we go back for a second helping and double our portion of time to 2 hours, then we must also double our distance to 20, to maintain the correct proportions. A full portion of space compared to a full portion of time is UNITY. Unity is the only thing that does not change, abstractly, because one needs smaller portions to make a difference. The correlation between Larson's concept of motion and the Alchemical prima material is a fascinating one, that I just ran across by accident, when working on the Magnum Opus book. If you give it some consideration... if you know the RS, it clarifies Alchemy quite a bit. If you know Alchemy, it clarifies the RS quite a bit. Worth taking a look at. It looks like this is proving out... Larson's "scalar motion" is the same concept as the alchemical "prima materia." It is no wonder the Alchemists could not explain it to the muggles and you had to be an adept in the system. 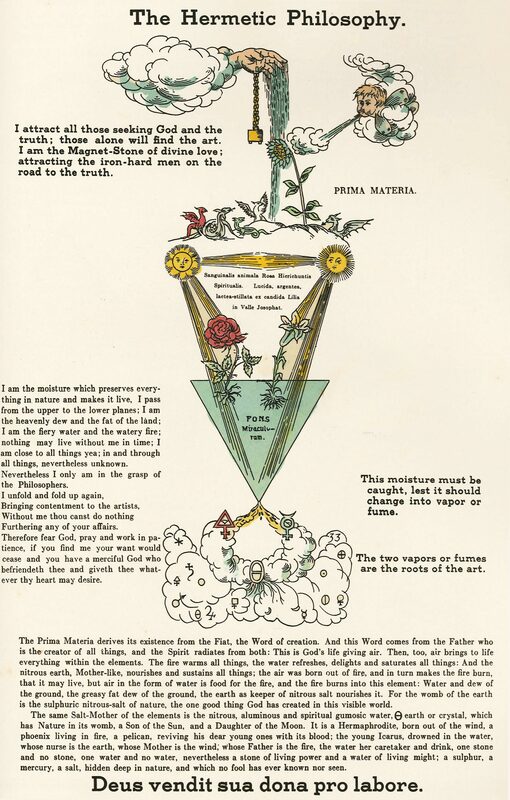 But once you bridge that connection... all of a sudden, Alchemy falls right into place, because you can use RS2 principles to determine the "natural consequences" of alchemy--and get around all the New Age crapola that has been introduced into it, getting back to the REAL stuff. You can see that nigredo/albedo is reciprocally related to critinitas/rubedo, where the former is stripping down to the bare fundamentals... fundamental postulates... and the latter is adding uniqueness, a building up. Red is the new White; yet very little is known of the alchemical rubedo, other than it was the final stage that produced the red, philosopher's stone. It is said that critinitas, the yellowing, is actually the stage where "alchemical gold" is produced... and that makes sense, "yellow gold," but then the final stage would be "red gold" -- and there IS a name for that, mentioned elsewhere on this forum: orichalcum. And I don't have to say any more; you are moving through the three scalar dimensions of motion--and once you pass Thredule, well, then you're talking ascension at that point, because you have run out of physical dimensions. I can see similarity in the "Mo pai Nei kung" basic practice, which is identical to Nei Dan (inner alchemy). Same thing in different terms used. In chemistry distillation process works the same way too, you gather sugar and yeast then ferment them and afterwards comes distillation. I am Grey. I stand between time and space. We are Grey. We stand between the cosmic and the material. You know isn't this a cross section of an anti-gravity drives core? It has the 3x in the middle there and 4 "arrows" pointing towards the center as applying of pressure to the chamber for "shifting gears" from gravity to anti-gravity or perhaps even to neutral a sort of hovering mode. Well thats a bummer that picture doesn't seem to come into this post for some reason. But you can see it above. Shush... people aren't supposed to know that I'm building a flying saucer in the basement. You can use the IMG tag (the icon with sun and mountains) and paste the URL of the image (normally, right-click on the image and pick "Copy Image Location"). But if you want to know the secret embedded in this image--it is a correlation between a quaternion and the RS speed ranges. Black/white and red/yellow form the polarity of two axes of motion (i.j), which implies a third axis (k). The three speed ranges are the consequence of rotating through the system. This is actually the key to understanding everything. This alchemical turntable is counter-clockwise. An undoing. Is that significant in understanding prima material/everything? Perhaps, reducing to unity? If so, what does it mean to us, living with free-will, abstractly, away from unity? I'm (pleasantly) surprised you caught that... Larson measures everything as a displacement from unity--"undoing" the speed of light, so to speak, in time or space. For us, unity is predestination. We "undo" predestination to obtain free will. I was reading on the "celestial stem" (天干) and noticed in the Manchu tabular correlation that their colors match... red, yellow, white, black -- but they also include green. It is also interesting that their calendar ends up being 10x6 = 60 years... just like the Sumerian. Got me thinking... realized that there is an "inferred" axis missing here... probably because half of it is not normally seen in the colors of the rainbow: green/magenta. It is analogous to zero/infinity, as we can see one (zero), but not the other (infinity). That would infer there are two more hidden "stems" that correlate to the complement to green, bringing the total to 12, which correlates to many other philosophies. Given that, then 12x6=72, the number of degrees in a pyramid angle, which is plastered all over Egypt (more Sumerian). It would also infer that there is a missing element in the 5-element system, which appears to be based on "5" being the number of man--"6" is the number of the "beast" (to be avoided by all good Christians). I suspected this to be the case, as when I started mapping medieval Alchemical elements to the Chinese Wu Xing, I had an extra--the one that corresponds to the concept of aether, void or akasha. The Alchemical elements, themselves, have an interesting place on the Wu Xing, being complimentary --mercury is "metal-water," occurring half-way between metal and water. So you end up with Eastern "elements" being functional, and Western "elements" being objective--two aspects of the same thing. Though I have not yet figured out where this "6th element" goes, but the references to "sky," "celestial," and "heaven" make me think it is "up" from the earthly elements. Maybe it goes to the middle of pentagonal points of other elements, to form a sort of five angled funnel in 3 dimensional connecting the dots. And it would look like a five sided pyramid which I believe is located on Mars. I initially colored the Wu Xing elements according to the standard, then realized that the Alchemical elements were a blend of these others... so went for a "gradient" pattern of transition. After I got done, I noticed how the colors around the Wu Xing elements were basically a "circle of influence" and took a quick look to see how they might be objectified, by circling the centers of the areas of color (dotted circles). In the Reciprocal System, atoms are "rotating systems" and inherently yin. Proceeding from that assumption, the Alchemical elements would be the yin aspect of this relationship, and the Wu Xing elements then act as "lines of force" between them, the yang aspect. This system can be viewed from either perspective, via object (Alchemy) or function (Wu Xing). But I find it more useful to view it like "dimensions of motion," where you cannot have one aspect without the other--a requirement of yin-yang. It also got me thinking about my RS model... Larson treats a dimension of motion as an inverse relation of space to time. In the diagram, that kind of scalar dimension would be analogous to charcoal/fire (yin/yang). But then the "wood" bit of charcoal gets lost. We could flip it around and go wood/charcoal, but then "fire" gets lost, as a conceptual relationship. Larson's model would have a similar problem--he gets around it by using "random distribution" (a distributed scalar motion), where the net influence is inward or outward from a location. But he only accounts for 3D spatial relationships (equivalent space). There is also a second polarity, that of Ke (controlling) and Wu (insulting), which are also a property of qi--but is inhibitory (sheng/cheng is "encouraging"). It prevents associations from forming. I suspect this concept is analogous to the "progression of the natural reference system" in the RS, since the progression wants to inhibit any combinations of motion from occurring. It is gravity that pulls things together. This is my first pass at developing a RS-based Qi model, combining Eastern and Western concepts. It seems all the pieces are there--and further study may help to improve the RS/RS2 models by filling in some of the conceptual gaps, bring science in line with philosophy. all these five depots are yin. all these six palaces are yang. The organs appear to be the spatial localization of the 5 element/phase functions. Since we know from Larson that you have to switch aspects of space and time (yang and yin) when crossing a unit boundary, that would make the organs yin and the Wu Xing elements, yang, having properties similar to a "cosmic dielectric field," or "thredules," as Nehru called them. The 6 "palaces" would have a nonlocal, yin component, with properties similar to "cosmic magnetism" or Nehru's co-magnetism. To clarify, I consider the dielectric field to be yang because it moves in straight lines--departs from a + or - charge and heads outward, radially, towards infinity (or the inverse charge). The magnetic field appears to be yin because it is circular--it always loops back to itself. Yin-yang concepts are easily applied to physics and mechanics because they can be determined by the type of motion involved, linear or angular velocity. The organs, themselves, also have a strong electric component (ion channels), as well as a diamagnetic field. In most atoms, there is a net, temporal rotation (magnetic) coupled with a smaller, spatial rotation (electric). In the life unit, I suspect this situation is similar with the nonlocal fields, where material and cosmic nonlocality are linked together to form the concept of bioenergy--an energy that can affect both realms (body and soul) concurrently. That changes the quality of bioenergy--not only is the energy intelligent, but it also has feelings. This is amazing work, i've only just had a very brief skim through Wu at http://www.biblio.nhat-nam.ru/Huang_Di_ ... ow-1-2.pdf but can clearly see the connections you are making with what is written about the qi, the colours, the organs, the body, the soul and how all of this links together. Yin-yang ends up being the Real axis projection of those coordinates, indicating a state of balance (Re(z)=0). What this system lack is the "imaginary" balance, Im(z)=0, which, curiously enough, appears to be found in CCM (Classical Chinese Medicine). Somewhere along the line, CCM and TCM bifurcated, splitting into aspects of CM--but each ignoring the other side (much like science ignores time and treat everything as spatial). When I attempted to combine the two systems, like I did with Larson and Nehru for the Reciprocal System (resulting in RS2), I discovered something fascinating... the coordinates, or the magnitudes involved in generating those coordinates, are actually irrelevant to the health condition. Turns out it is the ratio of magnitudes that hide the secrets of health. What are now treated as polarities should be treated as inverses, and the concept of "balance" needs to be understood as unity, not cancellation but in unison. And the nature of unison is scalar (as in "change of scale"). If I have yin(-) and yang(+) and observe a system of +++-, then one can say it is out of balance, being 75% yang and 25% yin. So now we have 75% yang, 25% yin mixed with 75% yin and 25% yang, resulting in 50/50: unison. SCALE is an important part of examining the flow of bioenergy in a living system. And how does one determine where the boundaries of scale are? Well... they are the obvious boundaries in space and time, things like a atom, a molecule, a bound aggregate, a cell wall, an organ, a body, a family, a culture, a society, a species. There are many boundaries of scale, none of which are ever at unison--but in the "larger picture," get closer to it. This may sound a bit like "returning to the one-ness" of things, and it is except for the fact that there is NO "return." It is recognizing that each and every scalar stage has a unique "displacement" from unison, that allows for certain physical and metaphysical interactions to occur--just like chemistry. So to find your place, your health, livelihood, or anything else, you do not see unison, but seek your displacement--what makes you unique in the system. This is amazing work. My mantra has always been "it's always about the balance" and finding an equilibrium but now i'll have to change balance to unison and displacement! With your diagram I can see a similar tool for healing in the future, where you look at your symptoms, find the corresponding opposite, take action to find balance/unity/unison and you have your cure. With unison being scalar, would this mean that you could find a cure for something then with the correct process you could heal/bring balance to a large number of people at once? Sounds to me like this was by design, much like the splintering of science into smaller components in order to hide connections and prevent us from seeing the big picture. Last edited by Djchrismac on Tue Dec 12, 2017 9:03 am, edited 1 time in total. Image error: The horoscope image file has expired. Please use the Free Horoscope menu to create your chart image fresh. Probably need to save the image and upload it to the site (you can drag and drop it into the message box, or click on Attachments tab). Thanks for the heads up, image now fixed.